We blogged last month about 123D Catch, a software package from Autodesk that lets you assemble 3D models from snapshots or video. 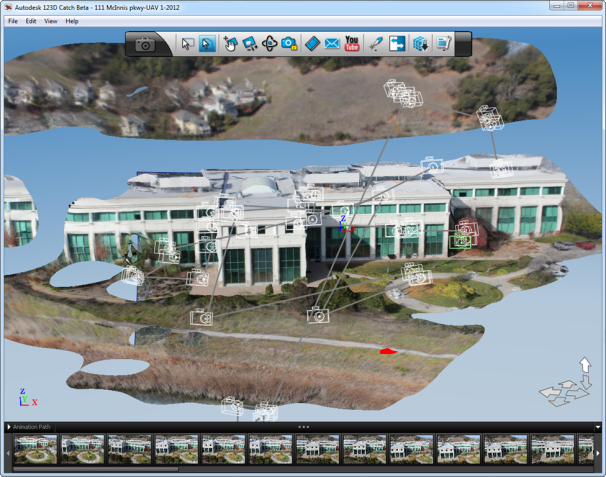 Autodesk demonstrated it by sending a microcopter around their offices and building a model out of the video it sent back. Now that software has come to your iPad, it's free, and it doesn't require any additional hardware besides the camera already built in. All you do is take a bunch of pictures at a variety of angles around the object you're trying to model, and the app will assemble them into a working 3D mesh suitable for inclusion in your next computer game or raytraced video masterpiece, or for 3D printing in plastic or chocolate on your RepRap or MakerBot. Autodesk is also launching a "'MyCorner' cloud locker" where users can store and share the models they create. With model creation and distribution becoming increasingly democratized, it's pretty clear that full-stack desktop fabs a la Doctorow and Stross are finally here. Now the question is, what do we do with them?